Voonik Technologies Pvt. Ltd, operator of an eponymous fashion marketplace, said on Thursday it has raised $20 million (about Rs 134 crore) in a Series B round of funding led by venture capital firm Sequoia Capital. Times Internet Ltd, Seedfund, Beenos, Beenext, Parkwood Bespin, Tancom Investments and FreeCharge founder Kunal Shah also invested in this round. The startup said in a statement it will use the funds to improve customer experience and personalization, and grow fashion platforms Mr Voonik and Vilara. Mr Voonik is an app exclusively for men's fashion and Vilara is a marketplace for designers and boutiques. The round comes exactly a year after the startup announced raising $5 million in Series A funding from Sequoia Capital and Seedfund. However, it said on Thursday it had raised $6.5 million in Series A and $500,000 in seed funding, taking the total amount mobilised so far to $27 million. The startup was founded by Sujayath Ali and Navaneetha Krishnan in 2013 and the marketplace was launched the next year. It claims to work on a 'lean' marketplace business model where it operates without inventory and fulfilment centres. Voonik claims to offer 15 lakh products from about 15,000 sellers. It also claims to have 10 million registered users and 8 million app downloads. Ali, who is also the CEO, said Voonik has become the "fastest-growing fashion company" in India within just three years of inception. "Series A helped us in gaining scale, and now with this renewed investor confidence through Series B, we are all set to consolidate our leadership in fashion commerce," he said. The startup competes with the likes of Rocket Internet-backed Jabong, Flipkart-owned Myntra and Tiger Global-backed LimeRoad among a host of fashion and lifestyle shopping portals operating in India. Voonik has been acquiring or acqui-hiring startups to expand. Earlier this month, it acqui-hired Zohraa, a marketplace for designers and boutiques; Styl, a salon and spa booking app; and Picksilk, an online silk store. 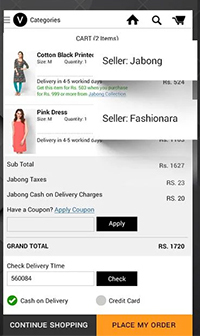 Voonik acqui-hired Bangalore-based shopping site for men Getsy in February and bought TrialKart, a mobile platform that provides a virtual dressing room experience, in August 2015. It had also taken on board four employees from Klozee, which recently shut operations. Sequoia reportedly closed a $920 million fund, the largest ever for investments in India, early this year. It was the most active VC firm in India last year but is going slow this year. The firm has backed ed-tech startups Byju's and Cuemath, mobile wallet MobiKwik, online pharmacy 1mg and juice maker Rakyan Beverages Pvt Ltd, among others, in 2016. Sequoia Capital India Advisors Pvt. Ltd. Voonik Technologies Pvt. Ltd.